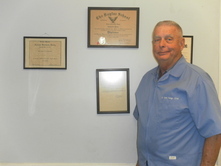 back home to Thomasville, GA and took over his father's veterinary practice, Dr. H. Grady Young, in 1970. ​*Limit ONE coupon/offer per client. NEW PRODUCT AVAILABLE: We are now offering a new heartworm/flea preventative that is custom made specifically for your pet. The new product costs around $15.50 a month versus the $26-$30 a month for Trifexis users. The cost of Trifexis is on the rise. However, the new product is one flat rate, no matter the weight of the dog! The new product does not have the side effects that concern some pet owners and as an added bonus...this product prevents TAPEWORMS! Please call or stop by the office for details.